Chapter 12 Bankruptcy Strategies provides an authoritative, insider's perspective on assisting family farmers and fishers who need to declare bankruptcy. 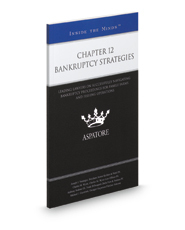 Written by top partners and chairs from across the country, this book discusses the fundamental differences between Chapter 12 bankruptcy procedures and the processes for Chapter 13 or Chapter 7 bankruptcies, showing attorneys how to evaluate when a client is eligible for Chapter 12 and when that might be the best option. Covering a range of topics from working with creditors and courts to developing repayment plans, the experts consider the best ways to keep clients' businesses viable going forward. Additionally, these leaders discuss the overarching trends in bankruptcy law, agriculture, and fishing operations, and how they all affect the process of Chapter 12 bankruptcy. The different niches represented and the breadth of perspectives presented enable readers to get inside some of the great legal minds of today, as these experienced lawyers offer up their thoughts around the keys to success within this specialized field.